Posted on Wed, Feb 8, 2012 : 3:09 p.m.
Trade seeds and chat about gardening at the Project Grow Seed Swap on Feb. 18 at Downtown Home and Garden. 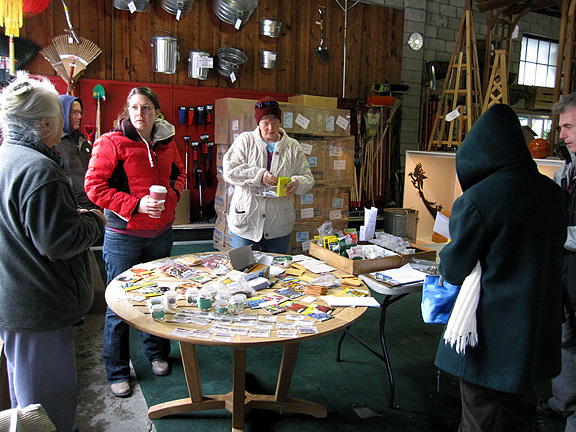 Get a jump on the growing season by attending a seed swap on Saturday, Feb. 18, from 10 to 11:30 a.m. at Downtown Home and Garden. The swap is hosted by Project Grow in partnership with Ann Arbor 350. This time of year, I'm just itching to do some gardening, which, in February in Michigan, pretty much means starting seeds. I have a lot of seeds I've collected from my garden, plus extra seeds left over from seed packets, and yet I still want to try new-to-me varieties! A seed swap is a great way to get rid of some of your extra seeds and get something new to grow — all for free! It's also fun to chat with other gardeners and get some growing tips. Here's how it works. 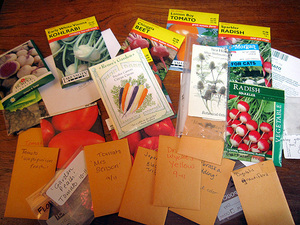 I'm bringing vegetable and flower seeds, some from my garden and some from seed packets. You can bring any kind of seeds to trade: flowers, vegetables, herbs, annuals, perennials, shrubs, trees — it doesn't matter. You can bring seeds you collected yourself or leftover seeds from packets you bought. You can bring the seeds in whatever packaging is easiest for you. If you happen to have paper coin envelopes or mini plastic baggies on hand, you can make individual little seed packets for people to take. If you just want to bring your opened seed packet with leftover seeds in it, that's fine, too. If you have large amounts of seeds, you can bring them in large envelopes, Mason jars, plastic tubs — whatever works for you. The important thing is to clearly label the seeds with the plant name plus any special instructions or notes (for example, "These seeds need to be soaked before planting" or "My great-grandmother brought these seeds from the Old Country"). Everyone brings seeds to the swap and puts the seeds out on large tables, so everyone can see what everyone else brought. You then decide what seeds look appealing to you, and you see if the person who brought them is interested in anything you brought. If someone has rare or expensive seeds, they may be more specific in what they will accept in trades, but by and large, people just want to get rid of their extra seeds, and they let you take some even if they don't happen to need anything you brought. The swap organizers will bring little envelopes and pens so you can take smaller amounts of seeds from larger packs and label them. If you don't have any seeds to trade but are really interested in growing from seed, do stop by as there are usually extra seeds available. The swap is open to the public. You don't need to be a Project Grow or Ann Arbor 350 member to attend. You also do not need to be a seed starting expert — people will gladly share growing tips! See you from 10 to 11:30 a.m. on Saturday, Feb. 18, at Downtown Home and Garden at 210 South Ashley in Ann Arbor. Monica Milla, the Garden Faerie, is a master gardener volunteer, instructor, speaker, garden coach and author of "Fun with Winter Seed Sowing."